NBASE-T™ technology defines a new type of Ethernet signaling that boosts the speed of installed based twisted-pair cabling well beyond the cable’s designed limit of 1 Gigabit per second (Gbps) for distances up to 100 meters. Capable of reaching 2.5 and 5 Gbps using the large installed base of Cat5e and Cat6 cabling, NBASE-T solutions enable users to accelerate their networks in the most cost-effective, least disruptive manner. Flexible silicon solutions can auto-negotiate the optimal network speed, be it the new NBASE-T rates, slower 100 Mbps and 1 Gbps rates, or—if the network infrastructure supports it—10 Gbps. Due to the rapid growth of ever-more powerful mobile devices and richer content like HD video, networks are struggling to keep pace with rising bandwidth demands. Adoption of advanced wireless connectivity technologies, such as 802.11ac WiFi, small cells and powerful workstations that handle large data files, means that network-access speeds must move beyond their designed limits of 1 Gigabit per second (Gbps) to 2.5 Gbps and 5 Gbps. NBASE-T™ technology supports these faster speeds without requiring a cable upgrade, thus economically meeting end-users’ needs. How About Upgrading the Cable Infrastructure? Upgrading the cable infrastructure requires replacing existing copper cabling with higher speed copper or fiber-optic cables. The cost of a cable upgrade is estimated to be $300 per cable pull. A campus-wide upgrade could cost hundreds of thousands of dollars. Category 5e (Cat5e) or Category 6 (Cat6) copper cables represent close to 100 percent of the installed cable infrastructure in enterprises around the world. Wholesale replacement requires substantial installation costs, time, and invasive disruption to the physical infrastructure of any enterprise building—cost estimates are billions of dollars worldwide. Running on already-installed cable, as well as supporting better cable in greenfield deployments, NBASE-T technology avoids cable upgrade expenses, reducing total cost of ownership (TCO). 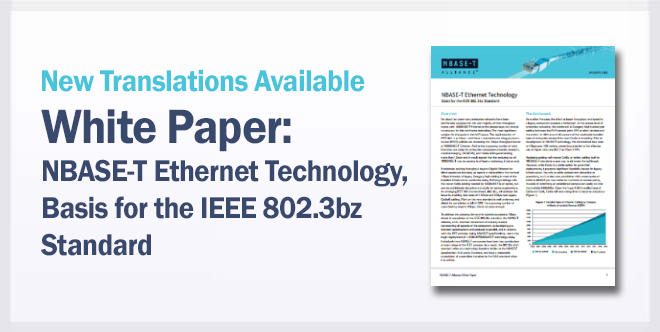 NBASE-T technology supports all Power over Ethernet (PoE) standards, facilitating its use as a replacement for existing 1 Gbps networks and making it ideal for greenfield deployments. PoE is fundamental in enterprise deployments, as well as large-building infrastructures, such as airports, shopping malls and stadiums. As its name suggests, PoE provides power to remote systems via legacy Cat5e or Cat6 cables. Fiber-optic cable connections, for example, do not have PoE capabilities. Introduction of NBASE-T technology can increase network speeds of existing Cat5e/Cat6 cables up to 5 Gbps at lengths up to 100m. Using advanced physical-layer integrated-circuit technology, NBASE-T solutions can be deployed on next-generation network switch interfaces, wireless access points, workstations, gateways and other systems, allowing administrators to avoid the wholesale replacement of cables as well as substantial installation time, cost and disruption associated with replacement. NBASE-T solutions are being widely deployed, providing content creators, broadband consumers and others a low-cost path to multigigabit speeds. Networking products based on this economical multigigabit technology are available today, and organizations seeking to upgrade their 1 Gbps networks should factor NBASE-T equipment into their plans.